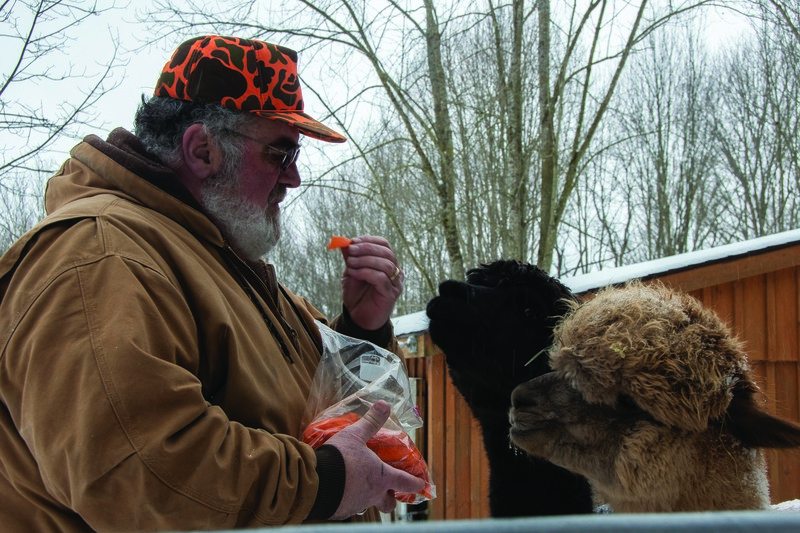 PEACEFUL EXISTENCE: Ray DiBono, owner of Artisan Alpacas LLC, feeds a carrot to one of the 12 alpacas at his home in Dushore, Pa. DiBono, a Sullivan County Rural Electric Cooperative member, credits his herd for his constant good mood. Encounters with wild animals are often brief, perhaps a momentary staring contest followed by one or more participants darting off in the opposite direction. Some binoculars could help in getting more than a fleeting glance, but to get up close and personal with many animals, a trip to a zoo — petting or otherwise — is usually the best option. But you don’t have to make your way to a big city to interact with wildlife; small animal parks may be as close as your neighbor’s backyard. Once upon a time, Ray DiBono, a member of Forksville-based Sullivan County Rural Electric Cooperative, had never even heard of alpacas — fluffy, mountain-dwelling cousins to camels — until his wife, Debora, had a chance encounter with them hiking along the Appalachian Trail while attending the police academy. Now with a herd of 12 huacaya alpacas, guarded by three Italian sheep dogs with paws bigger than their owners’ hands, the DiBonos run Artisan Alpacas LLC — part petting zoo, part store — from their home in Dushore, Pa.
To see the alpacas at their happiest (and fluffiest), colder days are better. As natives of the Andes Mountains, alpacas do not handle heat well. After the first or second week of May, the shears come out, the coats come off, and the four-legged denizens of Artisan Alpacas seek shade, as well as an occasional lap in the pool. Despite the heat management, DiBono says taking care of a herd of alpacas is no sweat. Alpaca farmers must also take careful precautions to protect their herd from meningeal worms, a deadly parasite transmitted by white-tailed deer, by ensuring they receive a monthly shot. Artisan Alpacas is open Thursday through Saturday between May and December from 11 a.m. to 3 p.m. Visitors can also schedule private visits outside those times and days by calling 570-928-8429 or sending a message to their Facebook page. Travel I-80 West for about three hours to Oliveburg, Pa., and you can find another couple living on an alpaca farm with a store of their own. Owned and operated by Patti LaCroix and her husband, George, members of United Electric Cooperative (EC) headquartered in DuBois, Pa., LaCroix Alpaca is open to visitors by appointment. Like the DiBonos, the LaCroixs invite visitors to feed their alpacas, feel their fiber and ask as many questions as they want. They also offer a variety of alpaca-fiber clothing and other alpaca-themed items from their store, La Petite Alpaca. But don’t wait too long — their farm and their alpacas are for sale. While more of a side gig, LaCroix still aims to stay in the alpaca business, hoping to combine it with a bed-and-breakfast concept and allow guests to help with some of the day-to-day tasks of rearing alpacas. Alpacas caught LaCroix’s eye because of their gentle nature and beautiful fleece, not to mention the ease with which one can rear them, but the desire to live on a farm — any farm — captivated her imagination long before that. Anyone wishing to visit LaCroix Alpaca can schedule an appointment by calling 814-938-9391 or using the contact form at lacroixalpacas.com. Interested buyers can also purchase products from La Petite Alpaca or inquire about alpacas for sale. 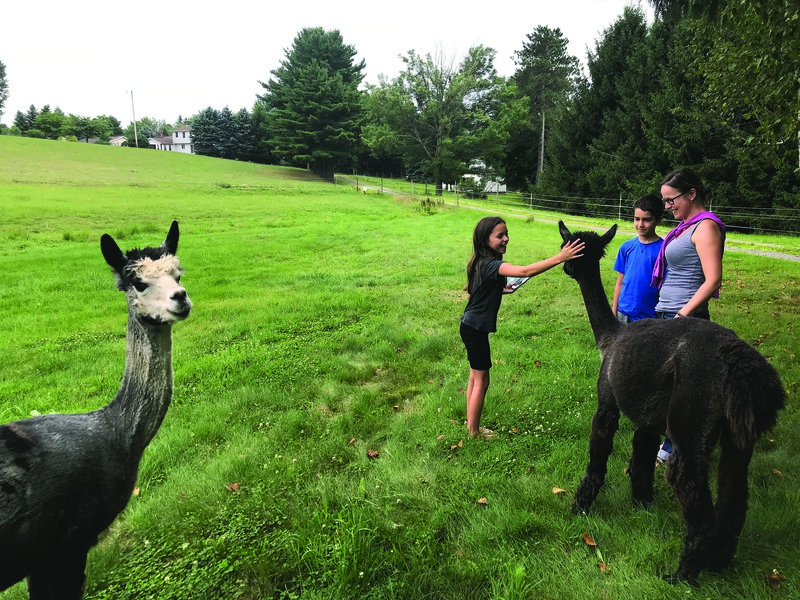 Alpaca farming makes up a small segment of a much larger aspect of rural Pennsylvania’s economy: agricultural tourism. Agritourism covers a wide range of activities in the Commonwealth, including everything from visiting alpaca farms to patronizing craft breweries. 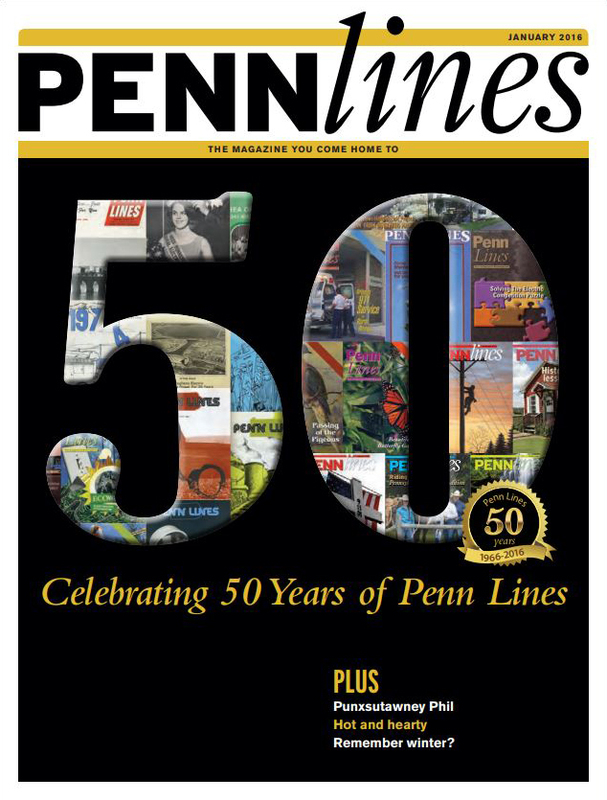 While the 2017 Census of Agriculture has not yet been released, an analysis of the 2012 Census of Agriculture revealed 727 Pennsylvania farms brought in an average of $35,389 in additional income annually thanks to agritourism activities, compared to just 303 farms reported in the 2002 census. One such beneficiary of the agritourism industry is the Double Diamond Deer Ranch, owned and operated by United EC member Ethel “Rusty” Snyder, in Cooksburg, Pa. “The Deer Lady,” as Snyder calls herself, and her husband, Roger “Shorty” Snyder, have 21 deer on the ranch, including possibly the oldest deer in Pennsylvania. 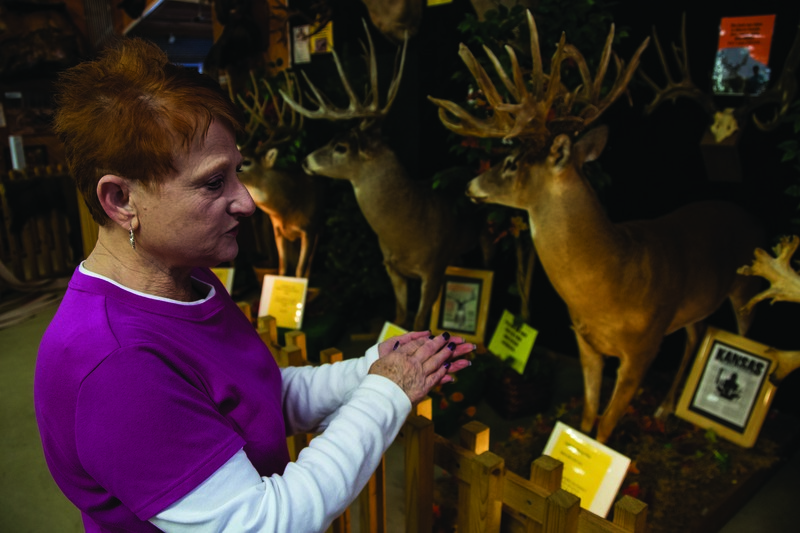 DEER DIORAMA: Ethel “Rusty” Snyder, United Electric Cooperative member and owner of the Double Diamond Deer Ranch in Cooksburg, Pa., shows off the deer museum attached to the front of her home. Visitors often confuse Snyder’s deer for albinos, but she assures everyone who stops by that they are white, whitetail deer. Beyond the lively cast of deer at the Double Diamond Deer Ranch, the Snyders maintain an ever-changing, ever-growing lineup of extras to draw new faces. A collection of decommissioned emergency vehicles, a pet rattlesnake, a set of coin-operated rides and even an indoor, glow-in-the-dark golf course surround the main attraction, partly to keep people coming back, but also to dispel the idea it’s a hunting park. Incidentally, the likelihood of deer being shot in Pennsylvania was the basis for the ranch. 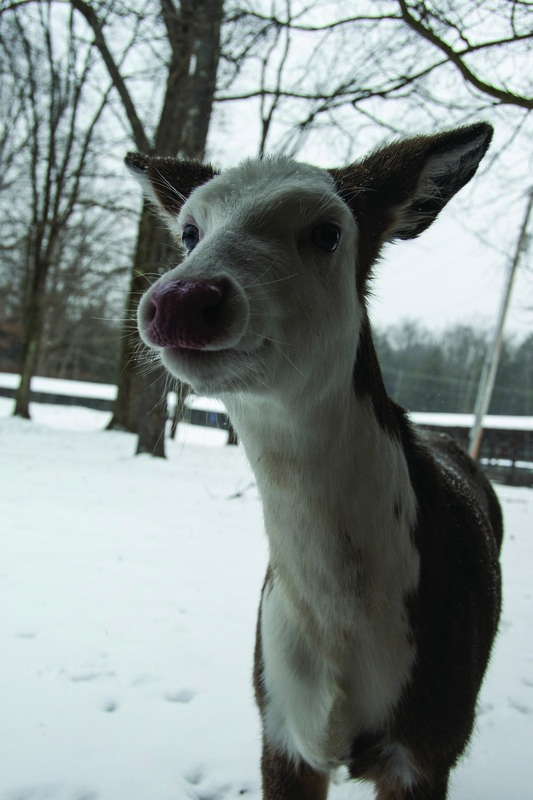 Curious to learn how long deer could live if they were not hunted so frequently, Snyder’s husband, then-fiancé, and his cousin got the idea to set up a small deer farm. Turning animals into a business calls for a trip to the local game warden, who will guide anyone interested in setting up their own animal park through the permitting process. In general, the Pennsylvania Game Commission handles most regulations surrounding wild animals (such as deer) and the Department of Agriculture handles domesticated animals (such as alpacas), but how animals are displayed, what other animals they’re kept with, and how the public will interact with them may dictate exceptions or overlaps to typical jurisdiction. Snyder and her husband have kept their operation almost entirely between themselves, having maybe one other person help on particularly busy weekends. That doesn’t mean she isn’t particularly busy if the ranch is calm. When she isn’t tending to her deer or her guests, she’s educating the community. A FAMILY AFFAIR: A family feeds and pets some of the alpacas at LaCroix Alpaca in Oliveburg, Pa. The business is owned by United EC members Patti and George LaCroix. No matter the creature reared or the products sold, DiBono, LaCroix, and Snyder have all found their lives as animal caretakers, in one way or another, to be a dream come true. For Snyder, it was an opportunity to find a home. For LaCroix, it was an opportunity to find herself. And for DiBono, it was an opportunity to find peace. DEAR DEER: A piebald whitetail deer at the Double Diamond Deer Ranch in Cooksburg, Pa., stares intently as she waits to be fed by her owner, Ethel “Rusty” Snyder, a United Electric Cooperative member.